Gary Anderson and Michael van Gerwen remain on course for a blockbuster World Darts Championship semi-final after very different third-round victories on Saturday night. Van Gerwen booked his place thanks to a 4-1 victory over Germany’s talented Max Hopp, while Anderson, celebrating his 48th birthday, somehow prevailed in a thriller against Jermaine Wattimena. Anderson won the seventh set of the match in extra-time to avoid what would have been the biggest shock in a tournament of surprises and remain on course for a possible showdown with Van Gerwen, who dropped a single set in a tough work-out against Hopp. Anderson and Van Gerwen won all four titles at Alexandra Palace between 2014 and 2017 and both have their sights set on a third world crown, with the Scotsman and Dutchman scheduled for a last-four shown – but only if they both avoid the fate that has befallen 16 seeds so far. 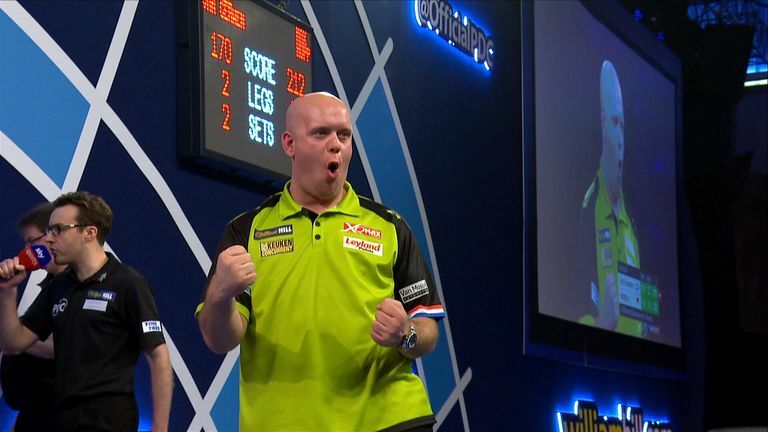 Michael van Gerwen brought the curtain down on a thrilling day of darts thanks to a victory over Max Hopp that was not without a scare along the way. 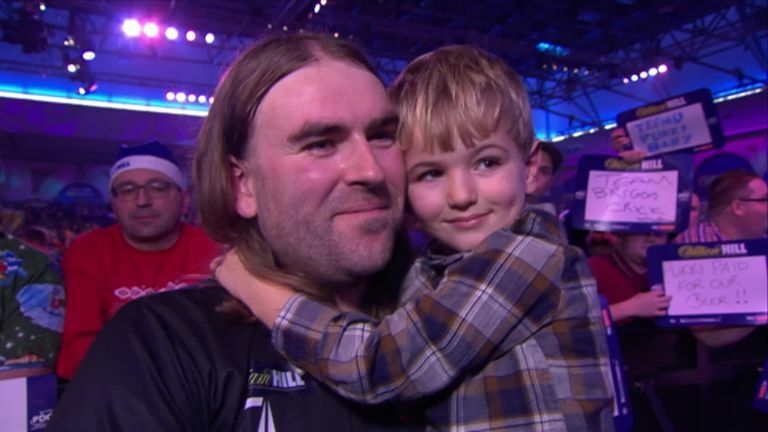 All looked well for the Dutchman, champion in 2014 and 2017, as he needed just 40 darts, with a 112 average and a maximum in all three legs, to canter through the first set and dampen the lively German crowd that had taken over a chunk of the arena. A 15-darter got Hopp on the board to start the second set but Van Gerwen, having seen Anderson struggle, seemed in the mood to lay down a marker as he reeled off the next three legs with the minimum of fuss before adding a 122 and a maximum 170 check-out in the third set to stand one set away from victory. However, that was the cue for a Hopp burst that underlined the 22-year-old’s talent. Aided by some wayward doubling from the Dutchman, Hopp took out five successive legs to set up what had looked an unlikely turnaround. 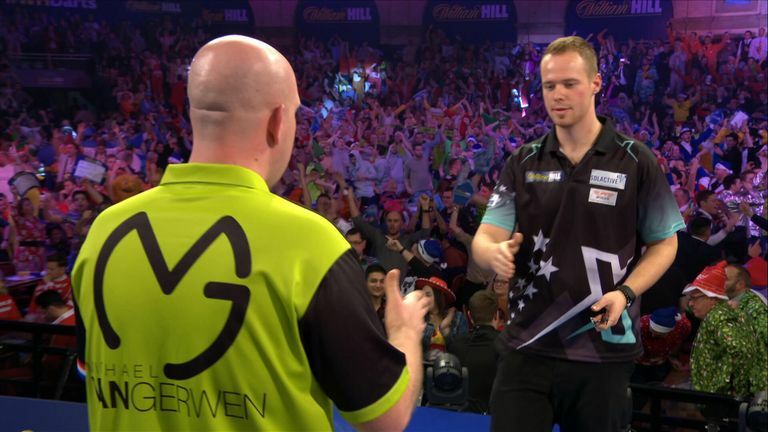 The German pinned a superb 148 to wrap up his first set and then won an edgy opener to the fifth set before moving 2-0 in front, but when he missed a dart at a double for the set, MvG pounced and strode on to victory. 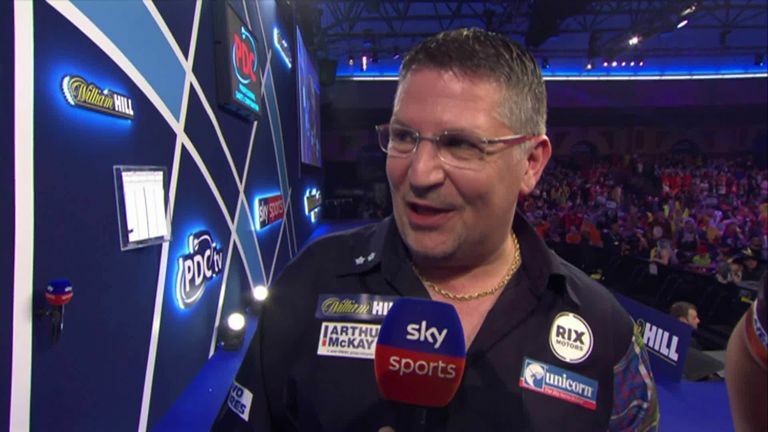 In a rapid-fire contest that featured five 100+ finishes and 14 180s, Gary Anderson eventually prevailed against Jermaine Wattimena. The Flying Scotsman, twice a champion at Alexandra Palace, fought back from losing the first set to stand on the brink of victory with a 2-0 lead in legs and a 3-2 advantage in sets, but he frittered away five match darts to hand Wattimena a chance. Handed a lifeline, Wattimena did not need asking twice, taking the third set and then reeling off back-to-back legs in 28 darts to level. Two more followed for a sensational 2-0 lead in the decider and the Dutchman fashioned himself a match dart when left with 170. He found the treble 20 with his opening two darts before narrowly missing the bullseye for a stunning turnaround and this time it was Anderson’s turn to fight back, eventually winning a classic 5-3 in the seventh set. William O’Connor and Ryan Searle took to the stage in the opening contest of the night as they battled for a place in the last 16, and it was world No 61 Searle who got the better of world No 50 O’Connor with a 4-1 victory. Searle claimed the opening leg but saw O’Connor reel off the next three in confident, but unspectacular, fashion, an average just over 80 enough to get the ball rolling. A finish of 103 got O’Connor off and running in the second set but a stirring run of five legs on the bounce saw Searle level the contest and then assume control of the third. The topsy-turvy nature of the match continued as O’Connor took out the next two legs and he then missed a dart at tops for another 103 finish and the set, which Searle punished via double eight for a 2-1 lead. It was soon 3-1 as O’Connor’s doubling deserted him, with Searle continuing to take the chances that came his way and, in the end, Searle motored to the finishing line as the Irishman fell away, winning just one leg in the final two sets. A last-16 date with Michael Smith or John Henderson now awaits Searle who has guaranteed himself at least £35,000 with the week of his career so far.